For the last few months, I’ve wanted to organize my knives. I’ve been told those magnetic strips scare people and dissuade them from buying your home. In-drawer knife trays are either the wrong size or the wrong price. I didn’t want a knife block on my counter-top. 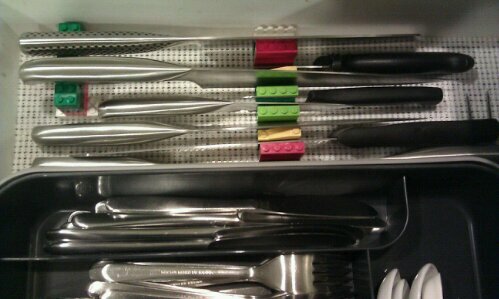 Everything seems to suit “knife sets” and not my mismatched collection from four different sets. Until today, I had my knives in a deadly mêlée in a drawer. This brings me to the moment today when I decided to just build it – with Lego. When I was younger, I was so consumed with Lego that I believed adults talking about a “two by four” were talking about the Lego block of that size. It’s strange that my formerly Lego-obsessed self did not think to make something myself – until I did. Sometimes, you just have to build it.